How does a recipe earn the label “gourmet”? Is it the ingredients, preparer, presentation, or where the food is being served that earns the gourmet recipes label? I spent a few hours researching the subject. First, I think the definition of gourmet food ought to be determined. Webster defines gourmet as “a connoisseur of food and drink.” About.com defines the word gourmet from three perspectives, as a food connoisseur, the quality of the ingredients, and a type of restaurant. The definition was relatively broad and somewhat bland. By these definitions, in no way am I a gourmet. Presentation is my biggest downfall, among other things. Even after following Foodalogue who always has a fabulous presentation, I still do not take the time to present a beautiful dish. The reasoning behind it really isn’t clear. It seems like I always have hungry people waiting to eat. Please don’t get me wrong, I am very open to gourmet recipes and enjoy learning to prepare new dishes. I found these delicious grilled halibut recipes and you know how much I enjoy our new grill still halibut is in excess of what the grocery budget allows. What fish can I substitute for Halibut? Since frequenting so many food blogs, I learned to make hummus. Of course, several recipes were combined to fit my liking. Perhaps this hummus qualifies as a gourmet recipe, what do you think? Combine all ingredients in a blender or food processor, starting with 3 tablespoons of olive oil, and puree until smooth. Add additional oil as needed. 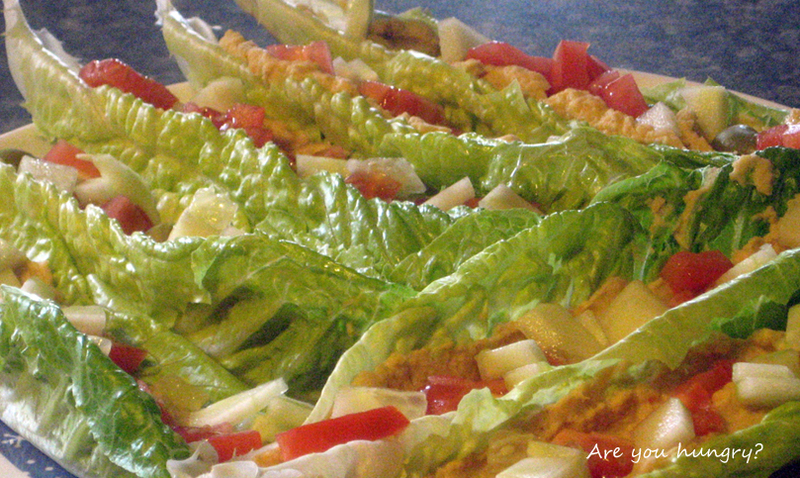 I used Romaine lettuce hearts, diced cucumbers, green olives, plum tomatoes, and green onions for the lettuce wraps. Spreading a generous amount of hummus in each leaf, top with the veggies and a sprinkle of salt, I thought these were fabulous. Red on the other hand was not so fond of them. He would rather I prepare something on that new barbecue grill like rum splashed fruit or better yet a few pork chops. What is your definition of a gourmet recipe?